iWall iPod Speaker Dock by DockHub. We review the awesome iPod & iPhone speaker dock tower which pumps out enough power to keep most people happy. My new iWall iPod speaker dock was delivered a couple of days ago, and I have to say I'm pretty darned impressed. For starters, it was ordered one afternoon, and it arrived at about 1pm the next day! We're off to a very good start indeed! The tower speaker dock (and I DO mean tower - it's about 1 metre high!) comes very well packaged - as it should be because it's quite a big, solid unit, weighing in at about 18kg fully packed. The very functional remote control comes already loaded with a battery - you just have to pull out the little plastic isolator tab, and it's good to go. I tried a number of music types in the iWall, from Taylor Swift, The Cranberries, Nickelback, Eminem, Black Label and Live, to a little Wagner and Rachmaninoff. It handled everything perfectly fine. 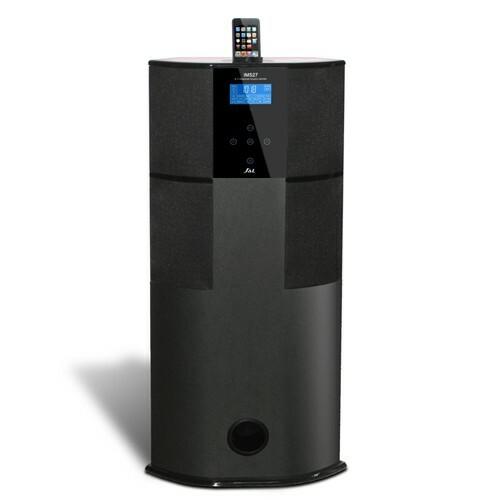 The iWall tower iPod dock is best suited to people in apartments, villas, or townhouses, or as secondary systems in larger dwellings. Volume wise, it won't blow your roof off (even though it reportedly pumps out 600 watts), but running at ¾ volume level, it was still enjoyable in the next room. Anyway, few companies report their real output power accurately - the best test is turn it on and play it - if it's loud enough with good clarity and low (or no) distortion, who cares about the quoted numbers? Speaking of numbers, the unit comes with a total of 7 (yes, SEVEN!) speakers - a rear facing 8" subwoofer, two tweeters and four midrange speakers at the front. Again, all do the job they were intended for. The manufacturer states that the sub is capable of about 26 watts, and I'd say that is a fair rating. The other speakers put out 12 watts per side (L/R) - quite adequate for small areas. I did pump it up to the maximum volume, and it still sounded fine - it's as if the amplifier has a governor built in which prevents a user from overdriving the speakers. The shape of the cabinet lends itself to being placed in a corner, with the rear of the unit cut at angles allowing it to slip neatly into the corner of a room. This would be a better position for the rear firing subwoofer too - not too close to the wall to create "muddiness", but close enough to generate crisp, reasonable bass notes. The front of the unit contains a display screen and five touch buttons which light up when touched, as well as an LCD screen LOOKS like a touch screen, but it's not. I have to say the panel display is a little "busy", and I think they would have been better off providing a simpler display system, rather than every function and setting showing on the screen all the time. The other thing about the display is it is a very bright blue, and it cannot be dimmed or turned off while in use. The only other thing I would "pick" on the iWall is the fact that it only has S-Video out for the video signal, and RCA inputs for audio. I tried the S-video out, and RCA in, but the problem is that my TV doesn't have S-Video in, so I had to plug it into my home theatre amp, and that upscales and processes video to such a point, even 20 year old VHS videos look good. But I guess it would be fine on a TV that accepts S-video in. I also found an old radio cassette and connected it to the iWall using RCA cables. It sounded great. By the way, it doesn't come with either RCA or S-video cables. 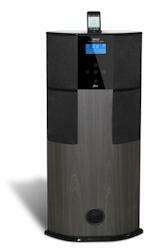 For video, summary, specifications and features for the iWall, please see the next iPod tower speaker dock page. iPod Speaker Dock Review By Rob Arnell, Senior Contributor at JustWeb Rating: 4.5 out of 5. 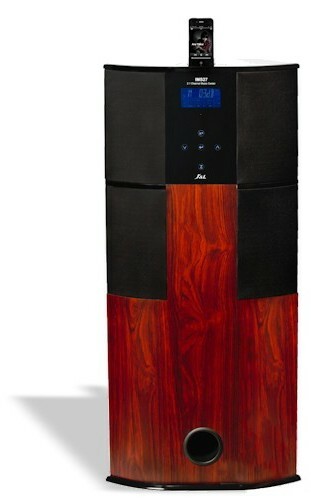 The iWall iPod (& iPhone) speaker dock is big, but it delivers a BIG sound too, and at a very reasonable price. 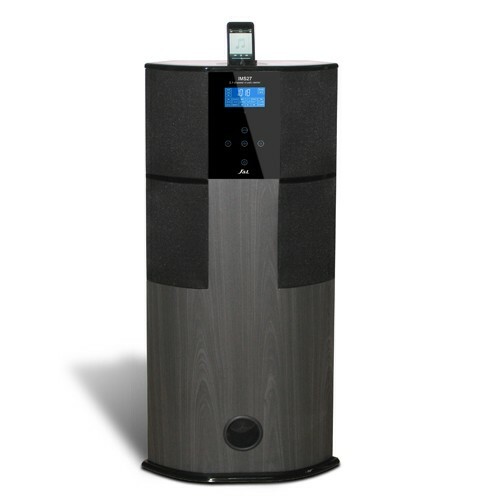 Absolutely perfect for apartments, small houses, or even as a secondary sound system in a larger residence. Great value, & great service from DockHub.